It’s the gayest mashup party of the year, as Bootie Seattle presents a special Pride month edition — it’s Madonna vs. Lady Gaga Mashup Night! DJ Schmolli, one of the world’s greatest mashup producers and DJs, flies in from Austria to make his Seattle debut, joined by Adrian A. from Bootie SF. Only $5 before 10 PM! For Pride month, it’s dueling divas as Bootie mashes up the queens of pop! 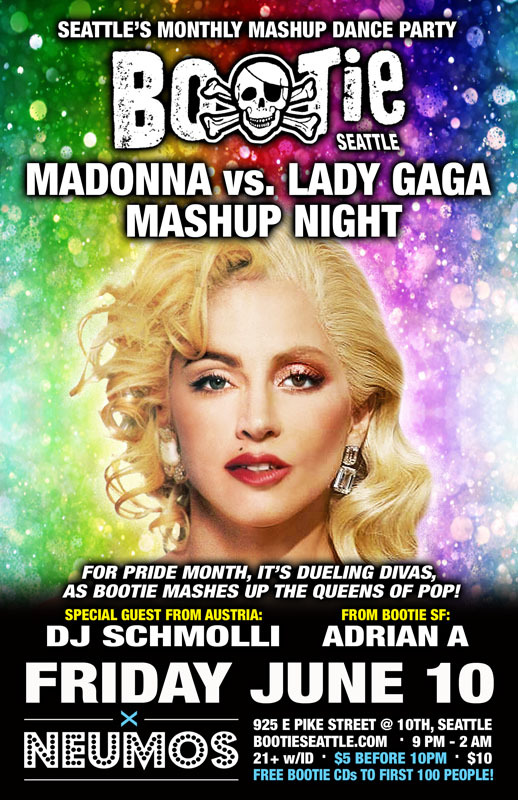 Bootie Seattle celebrates Pride month with a tribute to the first ladies of pop — it’s Madonna vs. Lady Gaga Mashup Night! Flying in from Austria for this special night will be a superstar of the mashup world, DJ Schmolli. He’s been producing mashups for the last 16 years, creating over 350 of them — many of which are staples not only at Bootie, but on BBC Radio 1 and Austria’s biggest station OE3. Joining him will be Bootie SF’s Adrian A, as the two throw Madge and Gaga into the mix all night long!